Parvati is an artiste, equally brilliant in the precise, graceful Bharata Natyam, the swaying, sensuous Mohini Attam and in the expressive, dramatic Tagore ballets. She mastered these dance styles from famous institutions in India, like Kalamandalam, Natyalaya and Santi Niketan. She had her training under Gurus Kittappa Pilli, Vyjayantimala Bali and Prakash Yaddugudde of Bhavan for Bharata Natyam, and from Kalamandalam Thankamani Kutty and the late Kalamandalam Kalyani Kutti Amma for Mohini Attam. She is also trained in dramatics and stagecraft. 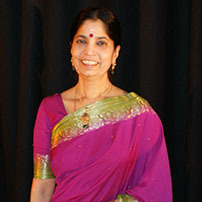 Since coming to the UK in 1988, she has been teaching Bharata Natyam and working at Bharatiya Vidya Bhavan, London. Under its auspices and on her own she has performed, choreographed and directed many shows and has also conducted workshops all over the UK and Europe. She has also directed and acted in plays in various languages. She has participated in all the major national festivals.